Hi guys, This is ChiNaEmotes 1.0 2012 Paltalk Emotions & Smileys! This is an Auto Installer, you dont need to do anything, Make sure Close your Paltalk! 3 - After Install, Start your Paltalk, and check out the new Emotions! Done..
Make sure to have your Paltalk Closed, I put the instruction below ones again! 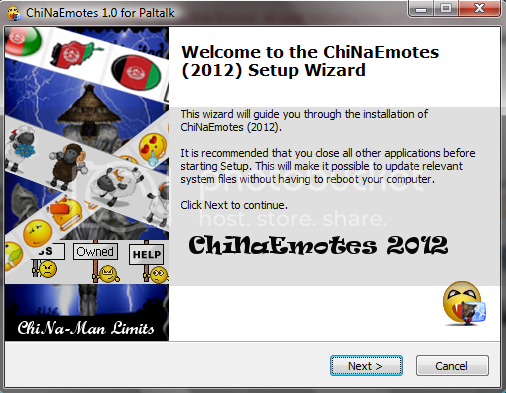 There is also an Original Installer if you wanted to delete ChiNaEmotes, then download and use the Original Paltalk Emotes.exe file! Thanks to all of you for your support to our forums! Last edited by ChiNa on Wed Feb 15, 2012 10:46 pm, edited 6 times in total.